Apple realised that wearing the iPod nano as a watch became a thing, so when they introduced the new iPod nano they tossed in 18 different watch faces to keep people from ever getting bored. Some of them are pretty weird! Here's five. Kermit is dope, I actually have no problem with him or with this. I'd probably use this the most, if we're being honest. 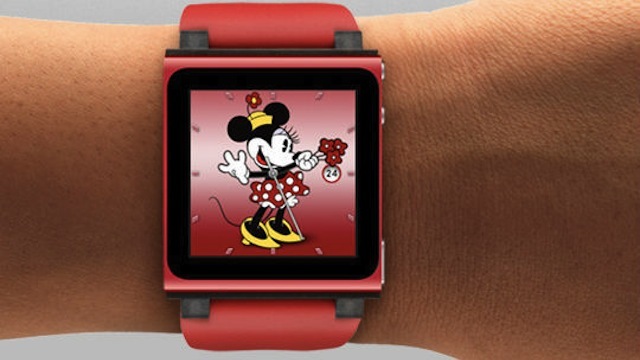 A Minnie Mouse watch is an obvious throwback to the old Mickey watch days but for the ladies. Though I don't even know if the ladies like Minnie Mouse? Was I just sexist right there? Oops. I'm not really sure what's going on here. Is it a leaf? Is it a green vine placed on top of a green wallpaper? I'm lost. Looks like a pedestrian crossing light that uses some new form of time telling that I don't think I would be able to figure out fast enough.